Author Written by Cleo Isco and last updated on Posted on March 30, 2019 . Posted in Categories All Things SAP. Many visitors of our blog are beginners in SAP world and we often received requests to publish a tutorial about SAP for beginners. For this reason, we asked one of the senior SAP consultants to share a story about his journey to working in SAP field. The name of this person is not disclosed for privacy reasons and I am publishing this tutorial about SAP for dummies on his behalf. I’d also like to thank this senior consultant for his contribution that will hopefully make it easier for many people to understand what is SAP and what are the career opportunities related to SAP. Before I entered in the SAP Consultancy, I had many questions. Mind was boggling with endless questions on how to proceed and become an SAP Consultant myself. All I knew was, that some SAP named product is there outside and its experts are very much high in demand plus this field pays very well with numerous opportunities to travel. My first encounter with SAP was back in late 1990’s, this was the year when this product was introduced and implemented in that part of the world where I belong. When I was in high school and in ‘Computer Applications’ course, one of our instructor mentioned SAP and gave a brief overview of ERP – Enterprise Resource Planning. Soon after completing my high school, I got a chance to intern at one of the MNC’s (Multinational Companies) which had an SAP roll-out and was the first company to become an SAP partner back in early 2000. During my internship, I managed to have a look at the SAP screens and due to my curiosity, I requested the guy there in finance (we both shared same first name) who was responsible to park incoming invoices; to teach me and I would like to do the few. He was generous to train me but gently refused to let me use his Login ID to park the invoices. Same guy taught me about SAP, what is SAP, how it is in demand worldwide and how the consultants holding SAP skills are well paid worldwide. To cut the story short and before we start with the SAP introduction and way forward if you are interested in making SAP your career, I would like to share a brief introduction of the writer of these words, i.e. myself. I have been part of SAP industry for almost now 09 years and basically I am an SAP Functional Consultant. I have been involved in SAP end-to-end life cycles, roll-outs, pre-sales, demos, support ticket resolution, troubleshooting, trainings and end user support. These words which you will be reading are solely based on my experience, observations and what I have learned during these 9 years of roller coaster ride during my career to give you an actual idea of what it is like to be an SAP Consultant. You can find more information in this post: What is SAP. Headquartered in Walldorf, Germany, SAP is the market leader in enterprise application software. In 1972, five entrepreneurs in Germany had a vision for the business potential of technology. Starting with one customer and a handful of employees, SAP set out on a path that would not only transform the world of information technology, but also forever alter the way companies do business. Now 44 years and approximately 300,000 customers stronger, more than ever, SAP is fueled by the pioneering spirit that inspired its founders to continually transform the IT industry. SAP is listed on several exchanges, including the Frankfurt Stock Exchange and NYSE, under the symbol “SAP”. ERP is an abbreviation of Enterprise Resource Planning. ERP helps an enterprise or an organization or a company to run its business effectively by planning its resources efficiently. These resources may be material, manpower or services. SAP ERP integrates various business functions of a company to eliminate the need of redundant or duplicate data entry. SAP ERP stores all the activities and business functions that the users perform in its database. Eventually all this data helps in making better business decisions in the form of large number of standard reports available. SAP ERP consists of several important modules based on different business functions of the company. We shall start with the Functional Modules. SAP FI Financials module is one of the most important modules behind SAP. It is designed for meeting all the accounting and financial needs of an organization. Within this module Financial Managers as well as other Managers within your business can review the financial position of the company in real time. The real-time functionality of the SAP modules allows for better decision making and strategic planning. The FI (Financial Accounting) Module integrates with other SAP modules such as MM (Materials Management), PP (Production Planning), SD (Sales and Distribution), PM (Plant Maintenance) and PS (Project Systems). SAP CO (Controlling) Module provides supporting information to Management for accurate planning based on costing reports as well as monitoring the operations of their business. Represents the company’s flow of cost and revenue, offers all the support information needed by Management for planning, reporting and decision making. Decision making can be achieved with a high level of information reducing drastically risks. Basically, it is a vital tool for management to carry out organizational decisions. It covers business functions such as procurement or purchasing and inventory management. The procurement can be for materials or services. It can be either local or imports (procuring from abroad) or both. Materials management (MM) is integrated with other modules such as SD (Sales & Distribution), PP (Product Planning), FI (Financials), CO (Controlling), PM (Plant Maintenance) and QM (Quality Management). Materials Management is used for channelizing procurement process and managing inventory at store/warehouse level. Handling Purchase requisitions generated from different modules such as PP, PM. The purpose of PP (Production Planning) is to ensure that the manufacturing runs effectively and efficiently to produce the goods as required by customers. The Production Planning module of SAP takes care of master data needed like bill of materials, routings and work centers. Production Planning modules caters all avenues for producing a finalized or finished good. It includes the time required to set up machine, the time required to produce a single finished good as well as catering the costs incurred in the process of manufacturing that can be both direct and indirect costs involved in the production of a single unit of finished goods such as: labor hours, machine hours, factory overheads that can be both fixed or variable in nature. Also, production waste, scrap and by-products. The SAP sales and distribution is part of the logistics module that supports sales to customers starting from quotations, sales order and all the way towards billing the customer. It is tightly integrated with the MM (Material Management), FI (Finance), CO (Controlling), QM (Quality Management), PS (Project Systems) and PP (Product Planning) functional modules. Sales and Distribution covers both sales of goods and services. It covers business functions starting from pre-sales such as inquiries, quotations, contracts (either quantity or value), scheduling agreements. Sales order management, pricing, discounts, credit management, executing sales order, creating outbound deliveries, creating invoice, recording accounts receivables, managing credit and debit memos, complaints management, i.e. return sales. Quality Management involves business processes involving quality control and quality checks in all aspects of supply chain management. Quality management is a method for ensuring that all the activities necessary to design, develop and implement a product or service are effective and efficient with respect to the system and its performance. Quality management is the comprehensive solution that supports the company throughout the product life cycle and along the supply chain. SAP Quality Management (QM) module supports tasks associated with quality planning, quality inspection and quality control through the enterprise. It sets the specifications for quality and standard testing procedures, controls the creation of quality certificates and manages notifications related to quality. It also stores the quality data for raw materials, goods-in-process and finished goods. Plant Maintenance covers preventive maintenance, predictive maintenance and corrective maintenance. The PM component enables companies to maintain their production machines in mint conditions through timely maintenance. PM module ensures that all the machines installed within the production facility and which are under company’s ownership are in working, properly and are in mint condition. They are looked after regularly to avoid major break down that can result in low production and loss in terms of major disaster if the machine should be scrapped altogether due to low maintenance. System regularly prompts and checks when the maintenance of a machine falls due. It is integrated with MM, CO and FI (Asset Accounting submodule) modules. Project Systems module covers business processes of a Project to effectively manage project of any size. It includes Work Breakdown Structure (WBS) elements, network, milestones and confirmation on the progress of each phase of the project whether it is completed or in progress and when it is scheduled to be completed, cost which is budgeted at each phase of the project, the cost already incurred whether it is within the budget or there is cost overrun at any stage of the project. PS is designed to support the planning, controlling and monitoring of long-term, highly complex projects with defined goals. To be able to control all tasks / activities involved in project execution an organized form is required specifically to monitor the status of the project and which is shared with all departments involved. Human Capital Management module includes business processes involving all aspects of company’s human resources, i.e. the employees. HCM module deals with the various activities carried out in the human resource department of an organization. Such as personal administration, personnel development, training and event management, payroll, etc. This module enables companies to effectively manage information about the people employed and for working for their organization. HCM module shares information with other modules such as Financial Accounting (FI), Controlling (CO), Production Planning (PP), etc. The payroll process uses accounts payable functionality to print checks, manage payments and bank information and process payments to tax authorities and other third-party vendors in case if third party employees are hired. Payroll results are also posted to General Ledger accounts for use in periodic income and expense reporting. For Management Accounting or CO, information regarding employment costs can be transferred to Cost Centers with in the CO module. Employees can be assigned to Work Centers, which are used in conjunction with modules like Production Planning (PP). ABAP is the programming language of SAP ERP and is used to create customized reports, layouts, screens, designing and developing company specific customized printouts such as quotation, sales order confirmation, delivery note, invoice, purchase order, etc. SAP BASIS involves SAP ERP software installation, taking timely backups, disaster recovery, security of the SAP servers, user creation, managing roles and authorizations of the users which includes authorization management to control which process owner is authorized which specific set of business transactions. SAP also offers some industry specific (IS) solutions which are unique in nature due to complexity of their business processes. SAP IS Solutions cover industries’ best practices and provide eminent functionality to carry out industries’ specific complex transactions which are unique due their nature of business. Which SAP module to choose? Following are the options, but not limited to, which people have been employing to enter in the SAP world, globally. You have just graduated or you have been a professional working in another field but would like to switch your career to SAP Consultancy. First thing and your priority should be, is to get certified in the SAP module which you have opted for. Companies prefer those candidates in fresh category who at least have certification in SAP module. If you are certified from SAP SE, it is a license that the candidate is aware of basic business processes and SAP’s functionality of respective module. Once you have acquired SAP certification or completed SAP Academy successfully, now obviously, you would like to enter in SAP world. Now, what are your options? There are preciously following options where you can opt for to start your SAP career. The companies which are opting for SAP implementation are a great source to start your SAP career. Companies opting for SAP do look for and hire SAP Certified Consultants to act as a bridge and liaise between SAP Implementation Partner and the Business Users so that the latter’s routine tasks and operations are not hampered. You as a fresh certified SAP Consultant will have an exposure of SAP implementation despite being on another side of the table but still you will be able to observe how the Consultant’s interact, understand business processes and design them. You being SAP support resource will be directly interacting with the SAP Consultants and Business Users simultaneously resulting in an understanding of not only company’s specific business processes but also getting trained on SAP front end transactions by the Consultants themselves. Company and the Business Users shall be heavily dependent on you once the implementation partner has left after completing the implementation cycle. You will be the first line of support and helping the Users in their daily routine of operations as you have end to end knowledge of business processes and have been intensively trained on the designed processes in the SAP. There are many companies globally which have already implemented and have been running SAP over a period. Getting hired in such companies is also beneficial for a fresh certified SAP resource. Since the companies are experienced in running SAP their processes and systems are matured. You will be required to solve the support tickets on daily basis which can be of different nature related to daily routine of business operations or the business has raised a new requirement in current process or a new business process has identified resulting Change Requests (CRs) for instance new business requirement in terms of adding a new functionality in the system all together or requirement of new report or new printout / output or the company is expanding into new line of business. One positive aspect is, since the business has matured processes and the system is running smoothly; the companies tend to scale upwards by moving into new dimension products to add value further to their existing systems. You shall be practicing your core implementation module and along with that the probability of learning new dimensions is high. Let’s try to give you a flavor of the phases or how is life at when implementing SAP, both from Consultant’s deployed by Implementation Partner or as an SAP Coordinator or SAP resource deployed at Client end. Following is the Accelerated SAP (called ASAP) methodology prescribed by SAP to follow to achieve the goal of successful SAP ERP implementation. In this phase, overview sessions on SAP ERP are held to provide an understanding of specific module(s) and functionalities, how they integrated with each other. It also includes preparation and finalization of Project Management Office, basic amenities for instance Projector, meeting rooms, stationary and it also includes identification of Process Experts, Power Users, End Users which will play a major role in successful SAP ERP implementation. In this phase, the existing business processes or business functions, i.e. AS-IS of the company are gained and how the same will be mapped in SAP ERP, i.e. TO-BE is documented and proposed. In other words, how business process owners will perform their business operations in SAP ERP system once the SAP is implemented successfully. In this phase, the SAP ERP system is configured in accordance with company’s business processes agreed and signed off during the TO-BE workshops. Several rounds of testing are also held in this phase where the users test the system and provide their sign offs confirming that the tested processes are in conformity with the processes agreed during the business blueprint phase. Testing is carried out based on different business process scenarios. The final SAP ERP system is made available to the business process owners. Before the user will enter live and actual data, master data, legacy data and cut over numbers are uploaded in the system. This is a very critical transition stage. Final round of SAP ERP system testing and end-users training can also take place in this phase. This is the most critical phase of the project when users are entering live and actual data in the SAP ERP and occasionally get stuck in the system. Helping users by quickly attending to any errors or problems encountered ensures that the SAP ERP system runs smoothly. We hope that this tutorial about SAP for beginners will help newbies in the SAP area to better understand what is SAP and what are career opportunities associated with it. 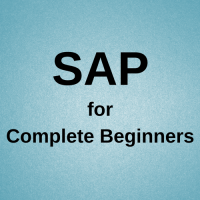 Besides providing the valuable insights, this SAP for beginners tutorial also contains numerous links to other resources that you might find highly useful. As usual, your comments, questions, and feedback are welcome in the comments section below. I have been certified in FI back in Nov 2014. Since then, my search for a roles in SAP began, as a fresher. But it is unfortunate that, until now, I haven’t got that opportunity. And I started to question; am I making the wrong decision and investment by taking this certification? With MYR22k study loan on my back, I began to feel the pressure. The companies are most likely to hired those with experiences, even without any certifications. So, what is the point having a certification if in the real working environment, it is considered as not so useful? I also think that SAP certification is much less important that experience and knowledge. It is a relatively minor factor in getting a job. But don’t worry, I truly believe that you will find a job very soon! Sometimes it just takes a little bit longer to find the perfect position for yourself. I have been working SAP GUI 7.4 (Prosoft and Cosoft) As the contract and Procurement Officer with the German International Cooperation (GIZ) in Africa for 4 and half years. I am presently residing in the USA since November 6, 2015. I want to do a SAP certification that will upgrade my experience in SAP. I am presently registered with ERP certificates and doing SAP SD. My plan is to take the certificate exam in SAP SD so that I can grow my chances of getting a job in the SAP market. I am also doing my masters in Acquisition and Supply Chain Management. I want advice as to which one of the SAP courses could be best for me that will raise my job profile. Thanks for your question! Since it is not directly related to this article, can you please post it at SAP Forum? I will answer it there ASAP. i have done dual masters one in finace and an other in human resource management. I am curious to learn SAP and work as a SAP CONSULTANT but i m in limbo which module shall i take as a career. I appreciate your advice and guidance for me please. I’d recommend to read this post: how to choose SAP module. Sir, Your tutorials for beginners to know what is SAP gives total insight to SAP. I have good working experience on finance, Materials Management, Quality control etc and now retired and my age is around 67. I have no experience on SAP. My understanding is now I should start from SAP training hup of a relevant field. I am planning to take up FICO first and other modules subsequently. If I am wrong kindly correct me.Thank you for the insight with crystal clear clarity. I’m looking for employment with the Post Office. The position Integration Specialist is asking for Knowledge of SAP current Version. Do you know what Version I should looking into? Hi , i have around 9+ years 9+ exp in to IT sales, inside sales in Domestic & International market, Education wise i have completed Diploma in Pharmacy, B.Com & MBA marketing . Although I don’t want to shift from my current functional role to Technical SAP consultant or similar to that. Wanted get big leap in terms of knowledge of SAP & other technical things. Heard about SAP Sales Academy. Would it be right path? i am a fy bcom student and would like to know if a diploma in sap would give me an edge in the marketing or finance sector; in any sector other than IT for that matter. i want to work in HR filed so how can i get SAP HCM basic knowledge, than i will go for certification. I am SAP end-user since 2005 and I was authorized to perform the following SAP tcodes: migo, mb1a, mb1b, lt03, lt12, vl10i, vl01n, vl02n, vf01, vf02, ysnt/ysnr. I am working as logistics/shipment coordinator for HGST-WD Philippines. And I like to switch my career as SAP consultant. What SAP module? would you recommend to me to take, How can I get a free training? Please check this post: How to Choose SAP Module. all companies are asking experience in SAP profile.its also difficult to get a internship in this profile. It’s true SAP implemented company never want to take on risk with fresher with no hands on experience. Because already there is talks on the community as just a certification in SAP is not sufficient but hands on experience in particular module and field of implementation will be preferred and given advantage. Still struggling take help of your friends or employee in re feral sites working in SAP to get referred, maximum of the case professional are hiring in SAP goes in background with reference, ugly truth. I have 1year of experience IBM BPM, to switch to SAP LABS which is the SAP’s similar product/tool . hi, i am a bcom student and would like to know if knowledge of SAP could aid me in a finance or marketing job. would it be useful to someone who doesn’t want to be a SAP consultant? what is the main difference between SAP MM and SAP SCM ? Is it have any similarity ? According to the current market trend which offers more job offers ? SAP MM is part of SAP ERP. SAP SCM is a separate software suit for supply chain management that is tightly integrated with SAP ERP. SAP SCM offers more advanced functionalities for managing supply chains of large companies. SAP SCM includes several business applications – the most popular are SAP APO, SAP TM, SAP EWM. The market demand is good for specialists in any of these software applications. I am working as an ERP Functional consultant but not in SAP platform, though now i would like to build my carrier with SAP MM Module therefore you’re kindly requested to send me the lessons related with SAP MM. I am currently working as Manual Tester and want to switch my career to SAP MM. What should be the steps to follow? I READ THE INFORMATION PROVIDED MY YOU. I AM GOING TO TAKE SAP HCM MODULE AS I HAVE EXPERIENCE AS A RECRUITMENT CONSULTANT. REQUEST YOU TO SHARE MORE INFORMATION ABOUT SAP HCM. THANKS IN ADVANCE. Happy Morning sir, I am srithar madhavan from Bangalore. I am having robust experience in Finance & Accounts over 29 years, looking forward to learn SAP-FA module. What is your advice? My name is Rajesh. I have over 10 years experience in BPO and want to pursue my career with SAP FA or HCM. Is it possible for me to go ahead with both these courses and get placed. IT – Networking, Hardware, Wifi, CCTV, EPABX etc. ERP – Security, Master Creation, Work Flow, query of users solving at front end, coordinating with ERP developers if any back end issue. NOW I WANT TO SWITCH OVER TO SAP SO WHAT COURSE SHOULD I DO SO THAT I CAN GET JOB IN SAP EASILY. How can manage Assets Handling in SAP? I am interested in self teaching SAP and this article is my starting point. So far so good! I am SAP certified in Production planning (PP) and Warehouse Management (WM) since 2016. after a couple of interviews, I didn’t succeed to get the jobs. But I am more motivated to get into that SAP job now more than before with little or no experience. How do I convince my employer in an interview? Previous Previous post: SAP Remote Jobs – Do They Exist and How to Find Them? Next Next post: How to Choose SAP Module?